I’ve gathered some photos and facts for your amusement while you wait for today’s big game. For Super Bowl I in 1967, the listed ticket price was $10, according to the National Football League. In 1967, that had the same buying power as $69.75 today, according to the Bureau of Labor Statistics' Consumer Price Index calculator. 16 of 23 passes on the night. The score at game’s end stood at 35-10, and Starr was named Most Valuable Player. Asked to comment on the match-up after the game, Green Bay Coach Vince Lombardi expressed the common opinion that even the best of the AFL--the Chiefs--"doesn’t compare with the top NFL teams." For four decades after its 1920 inception, the NFL successfully fended off several rival leagues. However, in 1960, it encountered its most serious competitor when the American Football League (AFL) was formed. The AFL vied heavily with the NFL for both players and fans, but by the middle of the decade the strain of competition led to serious merger talks between the two leagues. Prior to the 19 66 season, the NFL and AFL reached a merger agreement that was to take effect for the 1970 season. 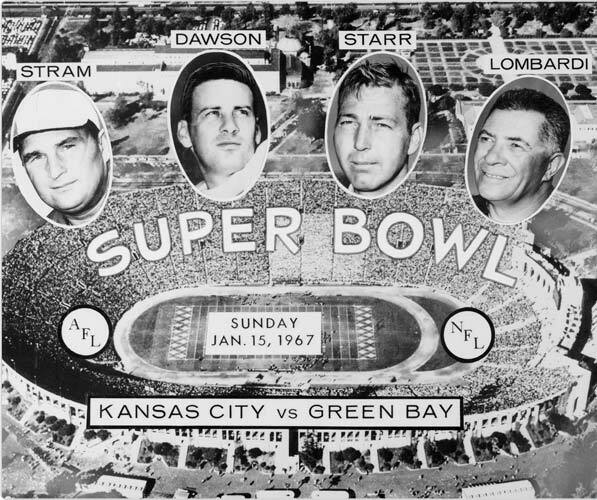 Lamar Hunt, owner of the AFL's Kansas City Chiefs, first used the term "Super Bowl" to refer to this game in the merger meetings. Hunt would later say the name was likely in his head because his children had been playing with a Super Ball toy (a vintage example of the ball is on display at the Pro Football Hall of Fame in Canton, Ohio). "I have kiddingly called it the 'Super Bowl,' which obviously can be improved upon." 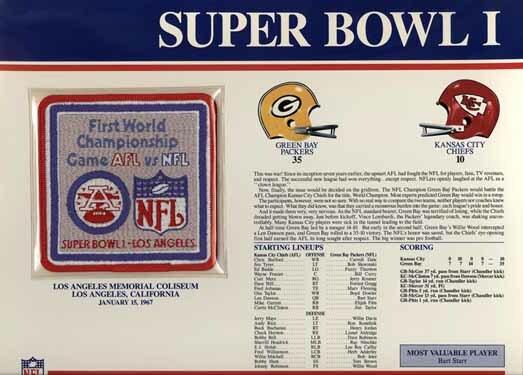 Although the leagues' owners decided on the name "AFL-NFL Championship Game," the media immediately picked up on Hunt's "Super Bowl" name, which would become official beginning with the third annual game. The "Super Bowl" name was derived from the bowl game, a post-season college football game. The original "bowl game" was the Rose Bowl Game in Pasadena, California, which was first played in 1902 as the "Tournament East-West football game" as part of the Pasadena Tournament of Roses and moved to the new Rose Bowl Stadium in 1923.